Hot drinks can be warming and comforting during the cold winter months and there are plenty of healthy, natural offerings to be found in your local independent health food store. Here at the Natural Food Company we stock a wide range of products from organic, fair trade and loose leaf teas to herbal teas, coffee and hot chocolate substitutes and medicinal hot drinks. We have a massive range of herbal teas from brands like Heath & Heather, Pukka and Yogi. We also stock our own loose leaf teas in flavours such as lime flower, lavender, hibiscus or dandelion. These are particularly popular with customers who want to make up their own blend from a recipe, often designed to help a health issue, such as supporting the immune system or helping with arthritic pain. Interestingly, a lot of our customers say that the flavour and aroma is better with loose leaf tea. With the boxed herbal teas the most popular flavours tend to be peppermint and fennel, although turmeric is becoming increasingly in demand as there has been a lot in the press about its health benefits. Valerian and chamomile, which can help with sleep problems, tend to sell quite well too. Organic alternatives to mainstream teas, like Clipper’s organic English breakfast tea and Earl Grey, are popular, and customers tell us that they like the fact that these come with unbleached teabags. We stock a good range of coffee alternatives such as Barleycup, which is a caffeine-free and gluten-free mixture of roasted barley, rye and chicory. We also sell roasted dandelion root which customers can grind down to make their own coffee. Dandelion is known to be good for the liver. Prewett’s organic chicory is another popular coffee alternative. There have been a lot of reports in the press about chicory being a natural prebiotic for digestive health so sales have picked up a little since then. Our customers are very well informed and often come to us asking about a health food they have read about or seen mentioned in a TV documentary. We find that people are becoming more aware of what they can do to help their own health problems. Hot chocolate alternatives include carob powders, which are dairy-free and caffeine-free and can be melted into hot milk – either normal milk or a dairy-free option. We also stock Hasslacher’s ‘Solid Bar’ Colombian drinking chocolate which is made from 100 per cent cacao and makes a lovely hot chocolate. Pure cacao is very nutritious. Another option is Iswari’s Macachino Dark, which is a mixture of carob, maca and lucuma. This goes well with almond milk and the maca gives it a heart-warming, nourishing feel like a malted drink. Green tea is very popular, particularly matcha green tea, which is more potent than standard green tea. Miracle Tree’s moringa tea is also liked by our customers. Moringa is a superfood that is particularly nutritious as it reportedly has more iron than spinach and more calcium than milk. There are so many healthy and natural alternatives to caffeinated or sugary hot drinks. Pop in to your local health food store and you’ll find a wealth of products to choose from. 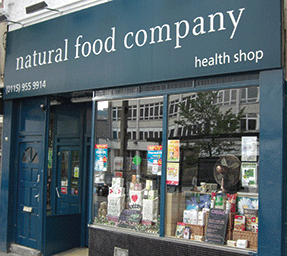 The Natural Food Company is based at 37A Mansfield Road, Nottingham. The premises has been used as a health shop for over 40 years and has a loyal base of customers who have been shopping there since it opened. Rachel took over the business in 2010 and today the store not only offers a wide range of natural health products but also provides vegan and vegetarian snacks which are served both hot and cold to take away. The shop is considered to be green and ethical and supports important causes such as Water Aid, Rainforest Alliance and the PDSA. The company slogan is: ‘Indulge in a healthier lifestyle’.